Dialectic essays differ from others first of all in that they should provide a deep analysis of particular subject from different angles and take account of its principal pros and cons. Not any topic can serve as an object for a dialectic essay. You can definitely write a dialectic story about the problem of abortions, where you can easily find both critical and supportive opinions in the plentiful literature on the subject. But if the topic is a landscape, your essay about it will be very likely descriptive, while the idea of writing a dialectic text on a landscape seems in most cases unprospective and such an essay will be rather artificial. 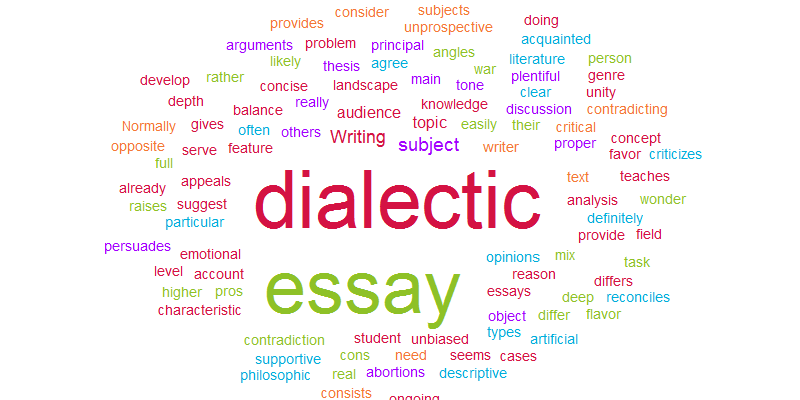 The task to write a dialectic essay teaches a student to consider all the arguments in favor and against a certain subject, which provides and in-depth and gives a really full concept of that subject (that is, all contradicting characteristic in their unity). No wonder that such a genre usually has a philosophic flavor. And what should the audience for a dialectic essay be like? Normally it consists of people who are already acquainted with the subjects and have their opinions of it, and those opinions are often opposite to each other. Then a proper essay writer on the dialectic field should be a person able to develop the ongoing discussion on the subject. In his story he reconciles, persuades, criticizes, and, in doing so, he raises the knowledge on the subject to a new and higher level. A real philosopher! Yet another feature this is the feature of unbiasedness and perfect balance: no emotional appeals. The reason is clear: the audience of a dialectic essay usually has a mix of options. So any incorrect tone would be very unwelcome. The audience of the essay is people who have an opinion about the philosophical issue. Some of the audience may agree with the writer’s thesis, whereas others may espouse the opposing viewpoint. Because the audience has a mix of opinions, the writer should strive for a fair and balanced tone that does not use emotional appeals or inflammatory language. Thus, as not any topic can be a proper topic for a dialectic essay, so not any ordinary student can write a really high quality dialectic essay. A lot or requirements have to be met: a profound background knowledge of the subject, and the above mentioned unbiased tone and the skill to maintain balance in the course of argument. Actually, a dialectic essay is a somewhat rare literary format. And this is the reason why. If you take a solid analytical and unbiased history of a famous war, like the American Civil War, displaying different views and assessments of the same events, it is essentially a dialectic work. But it is far from being an essay – because of its volume. But one should agree that they perform this their function quite successfully. As to the stages of wring a dialectic essay and, correspondingly, its main parts, here one can not find any considerable differences relative to other essay types. Like for most essay types, common rules suggest an introduction, preferably with a “thesis statement” that clearly and concisely outlines the subject and introduces the main part. The main part is the place for the bulk of the author’s dialectic efforts. It is exactly here that the phenomenon under discussion should be developed in the variety of its contradiction features. In the conclusion, the essay writer may somehow, in a concise and clear form, define the new comprehensive image of the research object and try to suggest ways of its further investigation and practical use of the new knowledge.